Students following the Arts stream in higher education have the lowest employability rate ranging around 30%, the Higher Education Ministry has revealed. According to ministry data, the employability of Arts graduates is 31.5%, while Management is 65%, Science is 68.7%, Agriculture is 69.5%, Medicine is 89.9% and Engineering is 95.1%. “We did this research to identify which sectors in universities are suffering from unemployment and its weak and strong areas. We wish to address the shortcomings of the weaker sectors, to develop the employability of our students,” Higher Education Ministry Secretary Dr. Sunil Jayantha Nawaratne told the Education Times. 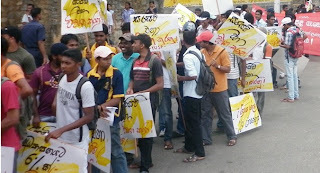 The Higher Education Ministry has also looked at employment rates of graduates by universities, and found that the highest percentage of graduates employed is from Moratuwa University with 94.3%, followed by Wayamba University 83.1%, Colombo University 62.8%, Ruhuna University 59.4%, Kelaniya University 57.8%, Sri Jayawardenapura University 54.2%, Peradeniya University 53.8%, Rajarata University 53.4% and Southern Eastern University only 36.1%. On further analysis, the employment rate of Peradeniya University’s Arts Faculty, which is its largest faculty, shows that Arts graduates from rural areas are considerably higher- 74.8%, than from urban areas- 49.3%. A total of 37.6% were in the public sector, of which, 5.7% in Teaching, and 31.9% in non-teaching positions, while 39% were employed in the private sector, the report reveals. A majority of these graduates- 52.6%, were earning a monthly salary less than Rs 20,000. Senior Director of EDEX (a programme providing higher education guidance, placements in higher education, skills development, career guidance and employment), Dilan Rajapaksha said that the employability of Arts graduates are low, because the skills required by prospective employers and that of the graduates are not compatible. “We have seen that employability of non-Mathematics and non-Science graduates is very low, because they don’t meet the requirements expected from the hirers,” Mr. Dilan said. He further said that the main aspect that affects employability of Arts graduates is the lack of English knowledge, especially, writing skills, hence, most students who follow subjects such as Sinhala, may find it difficult to secure a job. He also said that, however, this differs with regards to the job one is seeking. We did this research to identify which sectors in universities are suffering from unemployment and its weak and strong areas. We wish to address the shortcomings of the weaker sectors, to develop the employability of our students.